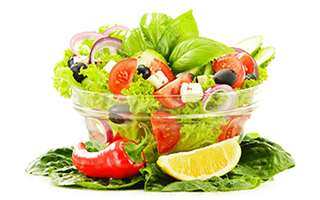 If you've ever tried to lose weight, you may have tried eating a lot of salads. And that's not a bad idea. But did you know that you could have kicked your efforts into a higher gear just by putting the right ingredient on top of your salad? There's a pantry staple that's not only a great ingredient in salad dressing, but a contributor to weight loss as well. This humble superstar is apple cider vinegar. We may not like to admit it, but the mice researchers use in animal studies tend to be pretty similar to us. In this particular study, the mice were ovariectomized (their ovaries had been removed), suggesting that these results could translate well to postmenopausal women, as their ovaries are no longer functioning. For this study, researchers created four groups of 10 female mice and fed them high-cholesterol diets. The first group served as the control. The second group was ovariectomized. The third group received a supplement of apple cider vinegar that constituted 0.6% of their diet. And the fourth group was both ovariectomized and received the supplement. They all ate the high-cholesterol diet for 28 days. Then the researchers measured a variety of values. They found that both groups who received the apple cider vinegar supplement experienced protection from erythrocyte, kidney, and liver oxidative injuries. They also had lower serum lipid levels. These results suggest that apple cider vinegar may help mop up oxidative stress, block lipid peroxidation, and raise levels of antioxidant enzymes and vitamins. Not bad for 0.6% of your diet. A human study involving 49 participants in a 21-day weight-loss program focused on dietary changes that included eating mostly vegan meals. In addition, the participants consumed a nutritional supplement drink containing alfalfa, wheatgrass, apple cider vinegar, and fulvic acid every day. The majority of the participants lost weight, and they also showed improvements in their LDL cholesterol. While apple cider vinegar wasn't the star of the show like it was in the mouse study, I do think it contributed to these impressive results. One of my favorite salad dressing recipes combines apple cider vinegar with some other healthy ingredients. Mix ¼ cup of apple cider vinegar, 1 or 2 tablespoons of raw honey, 2 tablespoons of water, 1-1½ teaspoons of high quality salt (Himalayan or sea), and ¼ teaspoon of pepper in a blender. Slowly drizzle ½-¾ cup of olive oil in until combined. Enjoy over a salad full of your favorite veggies. J Membr Biol. 2014 Aug;247(8):667-73. doi: 10.1007/s00232-014-9685-5. Epub 2014 Jun 4.